The OpsCenter Performance Service provides visual monitoring of diagnostics collected through the DSE Performance Service, displays alerts, and provides recommendations for optimizing cluster performance. The OpsCenter Performance Service combines OpsCenter metrics with CQL-based diagnostic tables populated by the DSE Performance Service to help understand, tune, and optimize cluster performance. 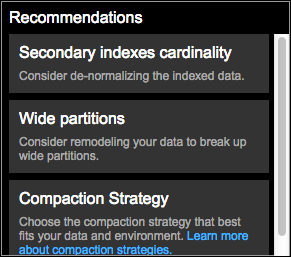 Slow Queries: Identify slow queries on a cluster to easily find and tune poorly performing queries. 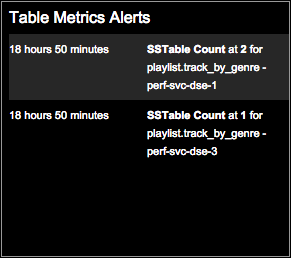 Table Metrics: Displays metrics to discover and diagnose poorly performing tables. Thread Pool Statistics: Displays information about Cassandra system-level details such as thread pools. 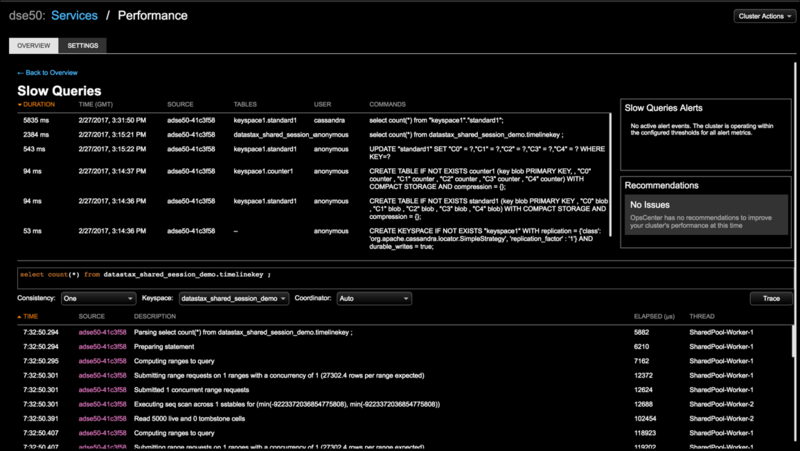 On each performance page in OpsCenter, an alerts panel feed displays triggered alerts. Any alerts you configure specifically for your environment appear in the panel. Note: Alerts for the OpsCenter Performance Service are not pre-configured. On each performance page in OpsCenter, a panel provides recommendations to rectify and improve performance issues. By default, all rules are enabled and scheduled to run every hour. Adjust the rule configuration to suit the requirements of your environment.